Take Your Place On The Boulevard. 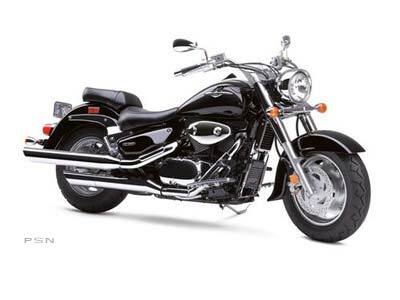 The Suzuki Classic Cruiser bikes capture all the kinetic energy of a crowded boulevard on a hot August night. And right at the head of the lineup is the Boulevard C90, the baddest cruiser on the block. With its long-stroke, 45-degree V-twin powerplant, the Boulevard C90 cranks out monstrous amounts of torque, which you can tap into for a raw rush of acceleration in any gear. The Boulevard C90 is equally at home on the wide-open highway. That's where you can kick back and enjoy its wonderfully spacious riding position, which lets you and your passenger stretch out and ride in comfort all day long. With its bold styling, lustrous paint and sparkling chrome, this is one classic cruiser that's bound to capture attention, whether you're cruising down the boulevard or kicking back at a rest stop. The Boulevard C90 - where classic cruiser styling meets awesome performance. Long 1,700 millimeter wheelbase chassis with 32 degree rake angle set-up for low seat height with comfortable seating and control positions. Wide handlebar and seat design, plus wide/low fuel tank shape add to C90's low-slung look. Double-cradle steel frame is made of large diameter steel tubing for strength and rigidity - bolt-on sections use painted mounting bolts and caps for a detailed look. Dual-disc front brake system and single disc rear with four-piston caliper for strong braking performance. Link-type rear suspension with preload adjustment combined with 41 millimeter front forks provide a comfortable, compliant ride. Fuel filler located below a locking cover to maintain sleek appearance with fuel tank mounted below the seat for a low center-of-gravity. Electronic speedometer with LCD fuel gauge, odometer & twin tripmeters. Standard four-way emergency flasher and high beam passing switch. Wide 150/80-16 front and 180/70-15 rear tire are mounted on custom-styled machined aluminum wheels. Fuel-injected, 90 cubic inch, six-valve, air/oil-cooled engine designed for maximum low/mid-range torque and acceleration. 45 degree phase, dual-pin crankshaft minimizes vibration, plus added flywheel mass enhances low/mid-range power. SCEM (Suzuki Composite Electro-chemical Material) cylinder plating is durable, minimizes cylinder size & weight and improves heat dissipation. Efficient SACS air/oil-cooling system with additional piston-jet cooling and engine oil-cooler. Hydraulic valve lash adjusters eliminate valve adjustment maintenance and ensure quiet engine operation. Silent operation cam chains with automatic tensioners reduce engine noise and maintenance. Hydraulic clutch with back-torque limiter ensures smooth downshifts. Smooth-shifting five-speed transmission with-low maintenance, low-torque-reactive shaft final drive - gear ratios set for low engine rpm at cruising speed. Right-side-mounted exhaust system with slash-cut-style mufflers tuned for low-rpm power and a throaty exhaust sound.